Nick Clegg has denied there is a "great coalition crisis", ahead of a speech in which he will distance the Liberal Democrats from part of the government's policy on free schools. The deputy prime minister will argue free schools must follow the national curriculum and should not allow unqualified people to teach. But he told Sky News this was part of a "grown-up" debate between the parties. Downing Street had expressed surprise at Mr Clegg's comments. They were established under a policy pioneered by Education Secretary Michael Gove and since September 2011 more than 170 have been opened across England. Currently free schools have discretion over what to teach, but in his speech to a school in north London on Thursday, Mr Clegg will ask: "What's the point of having a national curriculum if only a few schools have to teach it?" For three-and-a-half years, the Lib Dems have been part of a coalition that was committed to free schools. But some of these schools have had bad publicity recently. Nick Clegg wants to see changes that would "reassure parents". That would mean less flexibility and the imposition of certain minimum standards. But those close to the education secretary made it clear they were given no advance warning of the deputy prime minister's speech, and Downing Street officials are hinting that No 10 had been equally unsighted. Nick Clegg concedes he will not get his changes past the education secretary before the election, so he will pledge to make them in the next Lib Dem manifesto. But his criticism has ruffled Conservative feathers and his partners are suggesting the move owes more to the Lib Dem leader's need to form a coalition with his own core voters than it does to education policy. Expect to see further examples of where the coalition parties disagree in the run up to the general election. His next party manifesto will also say all schools should adhere to new standards on meals and demand that teachers are either qualified or near qualification. Last week, the head teacher of a primary free school in London, who was still studying for her postgraduate certificate in education, stood down following criticism from Labour councillors. There was also controversy when the Al-Madinah free school in Derby was classed as inadequate by education inspectors. In his speech to a London school this week, Mr Clegg will say: "I'm proud of our work over the last three years to increase school autonomy, which, in government with the Conservatives, has been through the academies programme." But he will go on to question "aspects of schools policy currently affected by the priorities of the Conservative Party which I would not want to see continue". Mr Clegg will add: "Whilst I want to give schools the space to innovate, I also believe every parent needs reassurance that the school their child attends, whatever its title or structure, meets certain core standards of teaching and care. A parental guarantee, if you like." Appearing on Sky News, he said he was a supporter of free schools, but his concern was about maintaining standards. He said: "Most head teachers and parents would expect that the teachers who teach their children have the proper qualifications." Asked whether his comments were a signal that the Lib Dems were moving closer to Labour's policy, with a view to possible coalition-forming after the next general election, Mr Clegg said this was "complete and utter nonsense". He added that "tensions" were part of being in coalition and said: "It's not a political crisis when some of those differences are articulated in public." A Department for Education spokesman said free schools were "raising standards and giving parents more choice". He added: "They are run by teachers, not local bureaucrats or Westminster politicians, and are free to set their own curriculum, decide how they spend their money and employ who they think are the best people for the job. This government is not going to take these freedoms away." Under plans announced by Labour, parent groups and other organisations would be able to set up schools outside local authority control, although local authorities would have greater powers to intervene when there were concerns about standards. But last week, shadow education secretary Tristram Hunt said a future Labour government would allow most existing free schools to remain open. On Sunday, Mr Hunt said: "Michael Gove and David Cameron's divisive Free Schools programme is unravelling for all to see. "But Nick Clegg is locked-in to this failure too. It is his policies that have led to the mess we saw at the Al-Madinah Free School earlier, the looming crisis in teacher recruitment and the 141% rise in unqualified teachers since 2010." A Downing Street spokesman said earlier that, as recently as last week, the Lib Dem schools minister David Laws had said he was "100% behind the coalition's free schools policy, which makes Nick Clegg's comments all the more surprising". 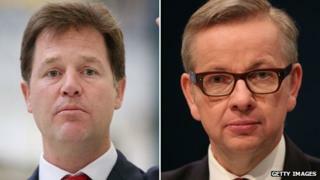 Michael Gove's allies have accused Mr Clegg of "fundamentally misunderstanding" the nature of free schools. Lib Dem sources have told the BBC that Mr Clegg argued for his proposed changes in cabinet but they were blocked by the education secretary. But Mr Clegg said current education policy was "something for Mr Gove" to handle and that he did not interfere in the workings of his department. His view was echoed by fellow independent school head, Katy Ricks of Sevenoaks School in Kent, who said she seeks "ability, enthusiasm and potential". "As an untrained teacher myself, my own experience and those of my colleagues around me demonstrates clearly that good classroom practice, of course essential to being an outstanding teacher, can be learned on the job as long as there is a supportive framework within the school," she said.